1983 marked the beginning of the famous Vacation franchise that made a lot of careers in the mid 1980's. Among those whose success was enriched in the film's ensuing success were director Harold Ramis, writer John Hughes, and of course the couple at the center of it all, Chevy Chase and Beverly D'Angelo. In the roles of Clark and Ellen Griswold, the two would be three of the only original cast members to star in each installment of the series. So naturally, they were invited for the modern sequel, and we have a photo from the film's set commemorating the moment the franchise was handed off. 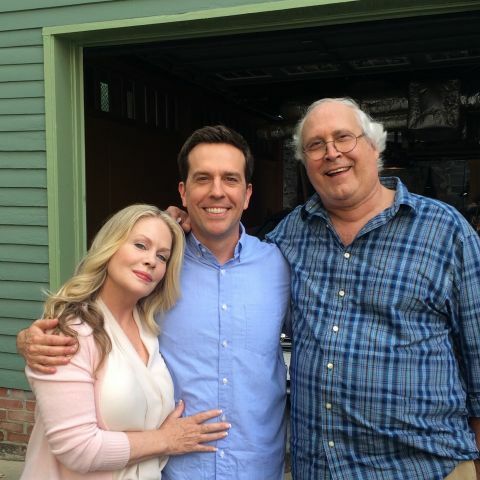 Courtesy of Ed Helms' HootSuite page, we now have the first photo of him as Rusty Griswold, standing in the middle of his cinematic mom and dad in the new Vacation film. Keep in mind, the last time you've seen the Griswolds on film was in 1997's Vegas Vacation, so if you've avoided seeing Community or Entourage, you're going to be a little surprised. If anything, the photo above is the ultimate seal of continuity for all involved. It may not be a seal of approval, but considering how John Hughes' estate has proven that they have no problem speaking up when they feel a project is disrespectful to the late filmmaker's legacy, the film is currently resting at a "so far so good" rating. Remember, if you're going to continue a franchise, it's probably a good idea to bring back at least a couple of the parties involved in its inception. While the exact story, as well as the children in Rusty or Audrey's families aren't hatched out just yet, the fact that Ed Helms and Leslie Mann are going to be the movie kids to Chase and D'Angelo in this new film is a good sign that the film is at the very least aiming for the right comedic direction. The fact that Chris Hemsworth and Charlie Day are along for the ride is the icing on the cake, leaving only the presence of Cousin Eddie as the missing ingredient. Though recent factors in Randy Quaid's life are probably a good reason as to why that ingredient is going to be missing. Still, Chevy Chase and Beverly D'Angelo look like they're having fun. What's better, they've aged rather well and naturally enough that there won't be any jokes about the kids looking worse than their parents. It's a tired joke, and comedians with the stylings of Chase and D'Angelo don't need to lean too much on old saws like that. With a cast to die for, and the writers behind Horrible Bosses at the helm, Vacation looks like it'll be a trip to Hell, but for all of the right (and hysterical) reasons. Vacation packs its bags and hits the holiday road on October 9, 2015. Here's hoping that if a European Vacation reboot is in the cards, Christoph Waltz is invited to take part.